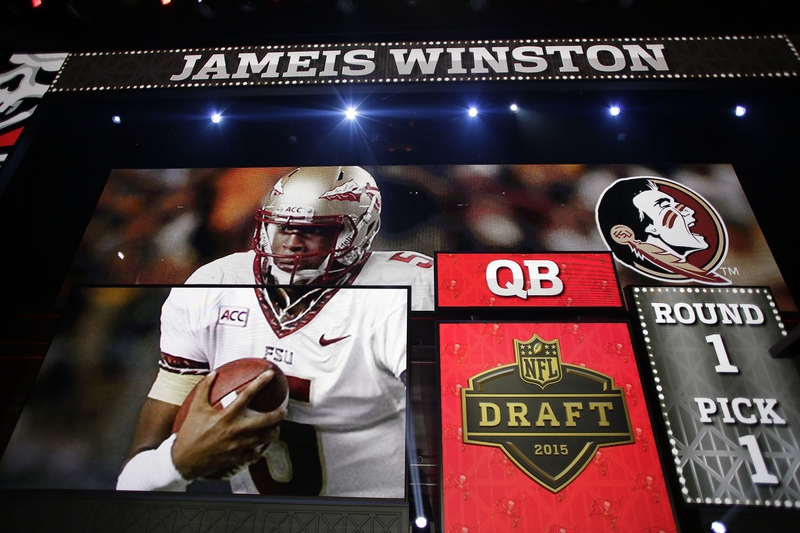 A screen indicates the Tampa Bay Buccaneers’ selection of Jameis Winston as the No. 1 overall pick at the 2015 NFL Draft in Chicago. For all of the speculation about trades at or near the top of the NFL Draft, there really was no drama at all Thursday night. As expected, the Tampa Bay Buccaneers picked Jameis Winston first overall. As expected, the Tennessee Titans picked Marius Mariota second overall. Two picks, two quarterbacks. That’s about as chalk as it gets. The rumors of proposed deals reached seemingly epic proportions as Thursday progressed. The Philadelphia Eagles apparently were so determined to land Mariota, who played for their coach, Chip Kelly, that they were willing to give up a large chunk of their team. Other trade talk involving the Cleveland Browns as part of a three-way deal also filled the airwaves. In fact, the first trade didn’t come until the 15th pick, which the San Francisco 49ers dealt to the San Diego Chargers, who then used it to pick Wisconsin running back Melvin Gordon. After the first round, Bills General Manager Doug Whaley said the team received no phone calls from other teams looking to trade for Buffalo’s 50th overall pick, in the second round, Friday night. Additionally, there was plenty of discussion about Winston’s character and whether that would discourage the Buccaneers from selecting him. But in the end, the Bucs and Titans stuck with the fact they each needed a quarterback and cashed in on their respective ability to select the top two rated players at the position in the draft. Biggest early surprise: The Washington Redskins using the fifth overall choice on Iowa offensive tackle Brandon Scherff. Seemingly determined to improve their front seven, the Redskins did the unexpected by not selecting the best available defensive player (and, perhaps player at any position), USC lineman Leonard Williams. Scherff is a terrific player, and the Redskins also needed help on their offensive line. But the Redskins might very well regret that they didn’t select Williams when they had the chance. Jets beef up their front: The Bills might no longer have the clear-cut best defensive line in the AFC East. The Jets are at least pushing them for that honor by selecting Williams, who surprisingly fell to them at sixth overall. With standout end Muhammad Wilkerson and disruptive tackle Sheldon Richardson, the Jets now have a potentially dominant trio. How good is Tom Brady feeling right now about the thought of facing the defensive fronts of the Bills, Jets and Dolphins, who have added Ndamukong Suh? Gurley early in breaking streak: There was little doubt that the two-year streak of a running back not being selected in the first round would be snapped by Georgia’s Todd Gurley. But it was a bit of a stunner that he ended up being chosen by the St. Louis Rams 10th overall. Gurley is recovering from knee surgery, and although all indications are he will be fine by the start of the season, most analysts saw him going later in the round. Of course, there were similar projections about Gordon, but the Chargers actually moved up to take him despite the fact that he needs work as a receiver and in blitz pickup. What would the Bills have done at 19? : The 19th overall pick, which the Bills traded to the Browns to get Sammy Watkins last year, turned into an offensive lineman for Cleveland: center Cameron Erving from Florida State. The Browns made the choice because of concerns that current center Alex Mack will opt out of his contract after the season. Given the players available, the Bills likely would have used the choice on an offensive lineman as well, but probably not Erving. The guess here is that it would have been tackle Cedric Ogbuehi of Texas A&M. There was speculation Ogbuehi might fall to the second round because of a knee injury, and according to NFL sources, the Bills were keeping their fingers crossed that he would be there for their first pick Friday night. Ogbeuhi wound up going to Cincinnati at No. 21. Chiefs take gamble on Peters: Cornerback Marcus Peters was one of the more controversial players in the draft because he was kicked off the University of Washington team last season for altercations with his coaches. But he also was widely viewed as the draft’s best cover corner. That apparently mattered more to the Kansas City Chiefs, who at No. 18 made him a higher choice than most analysts expected. Loading up on pass rushers and pass protectors: It was a big night for the trenches. Nine defensive linemen/outside linebackers and seven offensive linemen (including five tackles) were drafted. The last of the defensive linemen selected was Texas tackle Malcom Brown, at No. 32 by the New England Patriots. The Pats needed to fill the void created by their parting of ways with Vince Wilfork. Brown is not nearly as large at 6-foot-2 and 319 pounds. But who is? Tomlinson off the board: One player that some analysts thought the Bills would draft at No. 50, Duke guard Laken Tomlinson, was selected by the Detroit Lions at No. 28. He was considered the draft’s best player at his position, which is a top need for Buffalo.